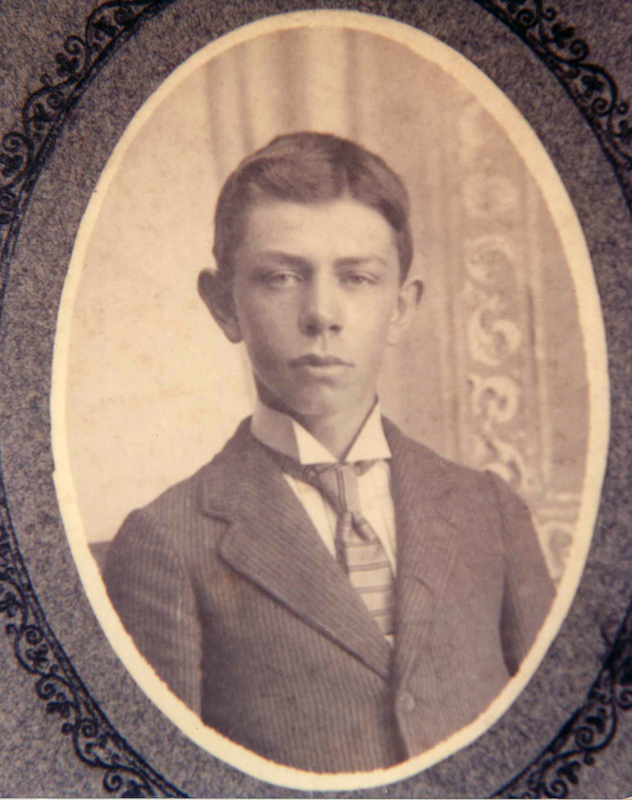 1891 Albert’s family moved to Champaign County from Tazewell County when he was five years old. 1898 Joseph Yordy family moved to Fisher when Josephine was five years old. 1907 Josephine became Albert’s wife. They were both 21 years of age. The couple lived in a house one mile east of Fisher. 1909 Albert and Josephine moved to a farm two miles south of Fisher in Newcomb Twp., where Elmer was born in that same year, then Orval in 1910. 1911/12 The couple had a farm sale, moved with their children to Colorado for Albert’s health. 1915 The family had returned to Fisher to a house Albert’s father built for them. 1916 Josephine became pregnant with daughter Eunice. 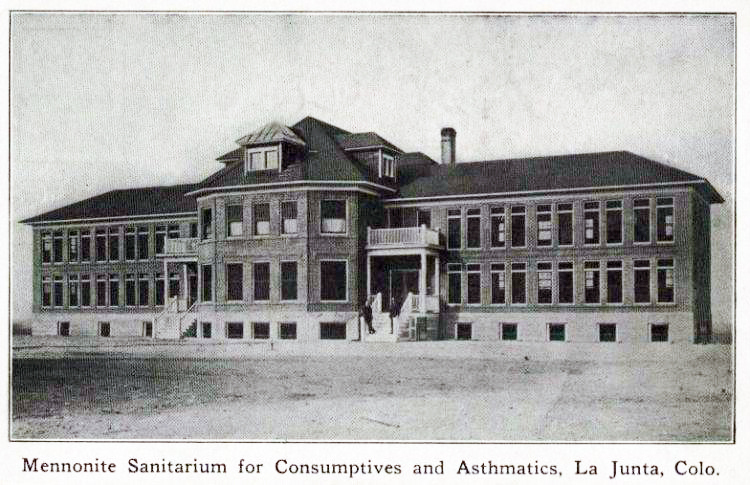 1915/16 Albert spent some months in Ottawa, Illinois at a tuberculosis sanitarium. 1917 Albert died January 9 and Eunice was born June 25. There was no Christmas tree adorning the farm home of Albert and Josephine Schrock just north of Fisher, Illinois, on Christmas morning 1916, but there were many presents on the dining room table, including a few toys for their two boys Elmer and Orval. In more than one way it was not a normal Christmas for the family. For six years Albert had been fighting tuberculosis. The dreaded disease has been called consumption, because it seemed to consume people from within, with a bloody cough, fever, pallor, and long relentless wasting. There is a slight difference between the two terms however, since consumption is considered the terminal stage of tuberculosis. When a youth of fifteen, Albert contracted the measles. As so often happened, the disease left him with some physical disability. His lungs were weakened and as a result his health after that was tenuous. It was a matter of debate, but generally accepted that measles had a direct influence in making a person vulnerable to contract tuberculosis. If Albert was like most tuberculosis patients, he experienced flushed cheeks, bright eyes, fever, loss of appetite, and of course the cough. The disease, after contracted, can remain dormant for long periods of time without causing symptoms, but if the immune system of the person becomes weakened it can reactivate and cause infection in the lungs and other parts of the body. Albert was a good student and while suffering the weakness of tuberculosis he spent much time reading books and studying the Bible. He was patient in his suffering, but fought hard to rid himself of the disease. idea in 1907. About 1905 the state of Colorado touted, “It is a fact, well known and recognized by the medical fraternity that the climate in this section of the state is the most beneficial to those suffering from tuberculosis or asthmatic affections of any climate found in the United States. Plenty of pure air, sunshine and mild temperatures are the climactic essentials in the treatment of the tubercular patients and there are to be found in abundance in this part of the Arkansas Valley. The alternative facility was in in Winfield, Illinois—Zace Tuberculosis Sanatorium—but Albert chose the Ottawa Tent Colony. He spent several months there during 1915-1916, with the family visiting him occasionally. Dr. John Colwell, a Foosland doctor, saw Albert a number of times between May 1915 and December 1916, when Dr. Colwell visited the home two days before Christmas. For some time prior to Christmas Albert had been feeling unusually well. He and Josephine must have hoped their prayers and cutting-edge treatment plan was working. Perhaps the worst was over. Josephine especially prayed that Albert was on the mend for she was three months pregnant. But just two days after the family had attended church together, on the cold morning of January 9, 1917, Albert kindled a fire in the stove very early in the morning to warm the house. Not long after, he experienced a pulmonary hemorrhage as a result of the tuberculosis, and died a short time later—just a few days before his 31st birthday. Josephine, always calm, was no doubt a stabilizing influence for their two boys as she cared for Albert in his last months. Much later in life she would also be of great help to her son Elmer’s four young children as his wife struggled with cancer for two bedfast years before her death in 1951. When Albert, a member of the Amish Mennonite community near Fisher died, Julius Unzicker was called to “lay out the body” of the deceased. The body was washed, dressed, and placed in the coffin. Mary, his wife, no doubt presided over meals for the family, and for friends and relatives who would come to the house to offer condolences. Several of the men relatives sat up with the body throughout the night until the visitation the following day. In the Amish tradition, Julius asked Josephine what persons the family wanted as pallbearers and singers, and any other funeral details. He then passed the information on to Lamb Funeral Home in Gibson City who cared for the embalming process and the purchase of a casket. Another decision Josephine and her family had to make was which team of horses would pull the open seated wagon hearse from the house to the church and then from the church to the cemetery one fourth mile west—the black team, or the bay team. The following day, a cold snowy January Thursday, the funeral was held at the East Bend Amish Mennonite Church. Samuel Gerber, a minister from Morton, preached the funeral sermon. Samuel was well known to the Schrock family from their days living in Tazewell County and was a participant in several Schrock funerals. After the casket was loaded into the hearse, one of Julius’ sons drove the team to the cemetery located on land donated to the church by Albert’s grandparents, Andrew and Veronica Sutter Birky, some twenty years before. “He [Julius’ son] would have been dressed in a full-length coat made of heavy horsehide with matching hat and gloves with long, elbow-length cuffs. The coat had wooden toggle buttons that were fastened shut by rope loops. 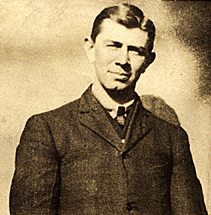 Albert Elmer was the son of John and Mary Schrock. His only sibling was a sister, Fannie. The family lived on a farm two miles north and one mile west of Fisher in a house built by his father, John Schrock. When Albert was not attending school he helped with farm chores. As a child, Albert and his sister, Fannie, attended Brown School not far from their home. It was a one-room school, and their father, John Schrock, was on the school board overseeing the education of the group of farm children attending. Albert joined the Amish Mennonite Church when 17 years of age. He was a deep thinker and chose to be right rather than popular. 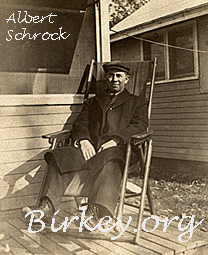 He served for a time as superintendent of the Sunday school that was organized in 1892. He was even considered a candidate for minister of East Bend Amish Mennonite Church, but the lot fell upon Joseph A. Heiser, his brother-in-law. The Joseph Yordy family had moved from Flanagan to Fisher about 1890 and remained there until 1911. 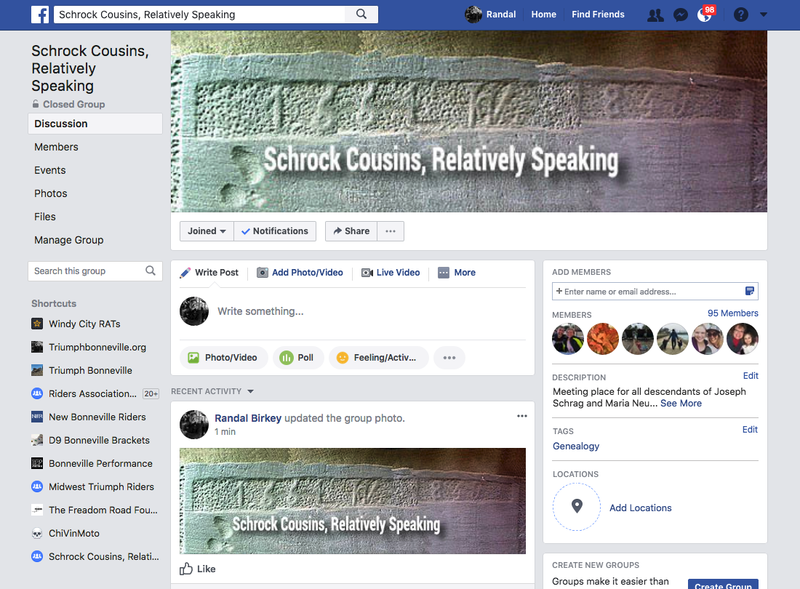 They lived a few miles away from the Schrock family and also attended East Bend Amish Mennonite Church where daughter Josephine was baptized by John C. Birky in 1901. The couple’s first home was a small house along the railroad tracks one mile east of Fisher. It was later torn down. 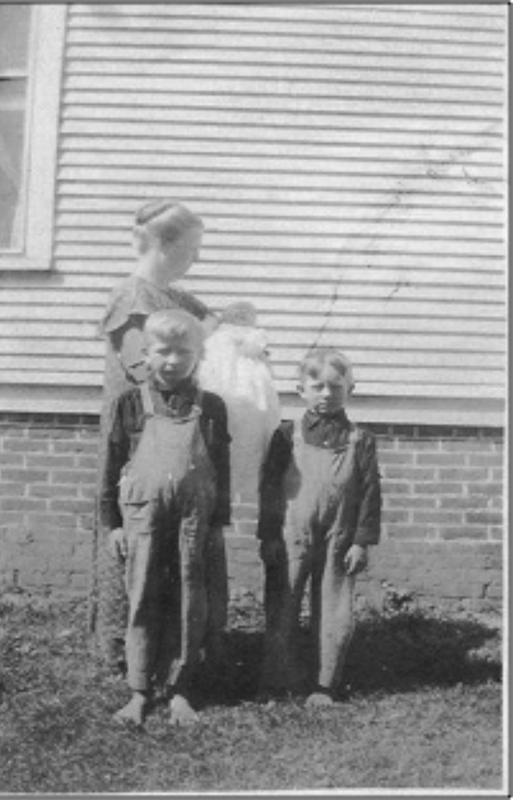 By 1909 they were working a farm south of Fisher and while living there two boys were born—Elmer in 1909 and Orval in 1910. 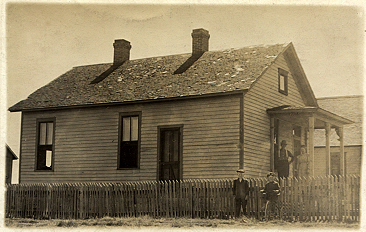 It was this farm they vacated in about 1911/12 when Albert, Josephine and two small boys packed their personal belongings and traveled to Colorado with hope and prayers that the dry climate would give better health to Albert. Fisher, Jan. 9–(Special. )–Albert Schrock, well-known resident of this community, died this morning at his home, two miles north of the village, after an illness of four years, due to tuberculosis. He had been unusually well of late and arose this morning and kindled a fire and shortly afterward was seized with a hemorrhage and died a short time afterward. The deceased was a son of John and Mary Schrock and was born on January 13, 1886. He was married about eight years ago to Miss Josephine Yordy, who, with two sons, Elmer and Oliver (sic, Orval), survive, as do also his parents. A sister also survives. He was a prominent member of the Amish church. The funeral will be held on Thursday from the Amish church, Rev. Samuel Gerber, of Morton, conducting the services. Burial will be made in the family lot in the Amish cemetery. Schrock. – Albert E. Schrock was born in Tazewell Co., Ill., Jan. 13, 1886; died at his home near Fisher, Ill., Jan. 9, 1917; aged 30 y. 11 m. 27 d.
He united with the Amish Mennonite Church at the age of 17 years and remained faithful unto the end. He united in marriage with Dec. 18, 1907. To this union were born 2 sons, Elmer and Orval who with his loving wife, are left to mourn his early departure, also father and mother, 1 sister, an aged grandmother, and a host of other relatives and friends. He was a very devoted Christian, living true to his convictions. He was elected superintendent of the Sunday school where he served faithfully until his health failed, when he was attacked with the dreaded disease, tuberculosis, of which he was a sufferer for four years. Much of this time he spent in reading good books and studying God’s Word. He bore his afflictions patiently and fought the disease hard, and died with a hemorrhage. He was a deep thinker, very conservative, choosing rather to be right than popular. Even with his afflictions he always took an active part in church work, being in Sunday school two days before his death. Funeral services were conducted Jan. 11 at the East Bend A. M. Church by Bro. Samuel Gerber of Pekin, Ill., assisted by the home ministers. Buried at the Mennonite cemetery. And with thee forever dwell. Illinois Mennonite Heritage Quarterly, “Amish Mennonite Stock Management, 1860s-1920s,” Debra A. Reid, Vol. XXXIV, No. 1, Spring 2007, P. 10. Alta Heiser Detweiler, typed memories. Date unknown. Changing Funeral Practices and the Lives of Julius K. (1864-1961) and Maria (Mary) Oesch Unzicker (1869-1928) by Kathryn Cender Martin. Illinois Mennonite Heritage Quarterly, Vol. XXXVIII, No. 3, Fall 2011. Albert and Josephine were second cousins. Their common ancestor was Christian Birki (Birky) and Maria Anna Gascho (https://birkey.org/wc01/wc01_219.html), whose daughter Mary married Peter Yordy in 1847. Mary was known for her “pap” given to sickly infants with feeding problems and perhaps that is one reason two of her granddaughters, Anna and Josephine Yordy, were also known for their semi-professional nursing skills.